Sale prices expire 12/31/18 at 11:59pm. Free Shipping Offers apply to standard shipping to the contiguous 48 US States only. Truck/LTL and Oversized and Drop Ship items excluded from Free Shipping. All orders $35 or more receive FREE Standard Shipping to the contiguous 48 states. $7.95 Flat Rate Shipping up to $34.99. All Email Offers and Coupons are only redeemable through JerrysArtarama.com and cannot be redeemed at any of our retail store locations. 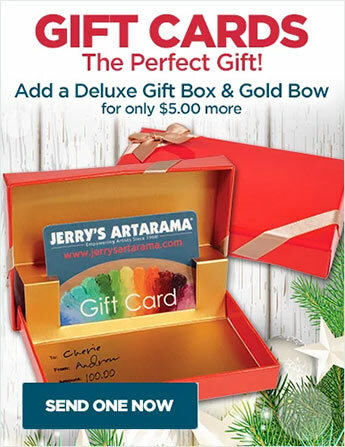 Offers cannot be applied to previous orders, nor combined with any other JerrysArtarama promotion, including offers made in the same, previous or subsequent emails. 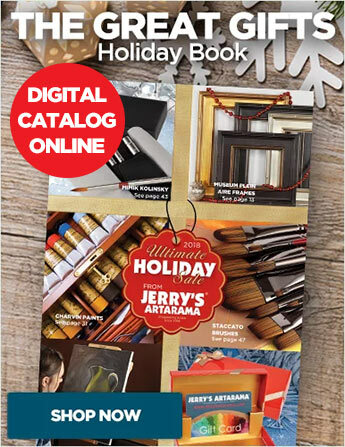 Any items that are excluded from coupon discounts will be clearly indicated on the shopping cart screen before checkout. All Sale, Specials, Super Sale, Overstock, Closeout and LPP items are ineligible for further discounts. See product pages for details and prices. Jerrys Artarama assumes no liability for grammatical or graphical errors.